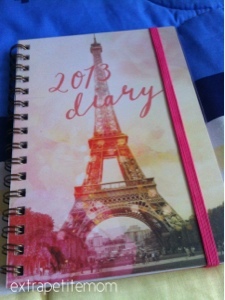 Anyway, I bought this diary when I was in KL. I could not find a pretty and cute diary here - of course since I was looking for it in early this January and I believe the shops started selling 2013 diaries few months before 2012 ended. All the pretty ones are long gone already. Do you have a diary or journal? How often do you write in them? I have always been a diary/ journal girl. 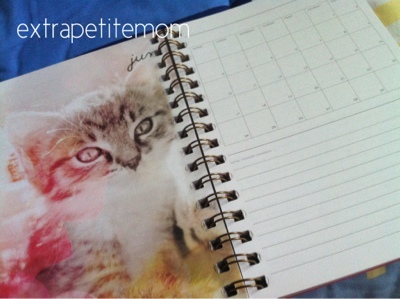 It used to be like a note book but now, I prefer it to have a monthly view calendar and a lot of pages for notes. I like to scribble a lot of notes (wishlists, comparison of things and prices, etc), so I don't write nicely in weekly view pages. Hence, I like monthly view for all the important dates and events. Nice diary btw and yes, I love Paris and the kitten is cute!